(This was previously posted on 3/2/12, but Blogger lost a bunch of posts. This is a repost. 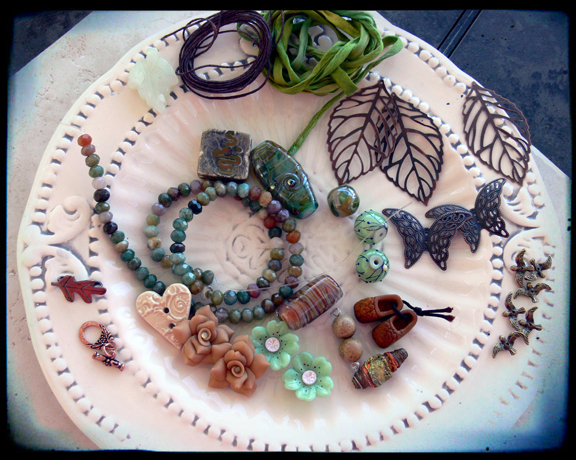 I'm so excited to bring you the 5th Bead Soup Blog Party! 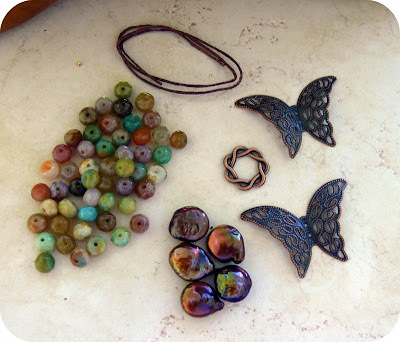 The premise of the blog hop is for two people to swap beads and then make something from those beads. 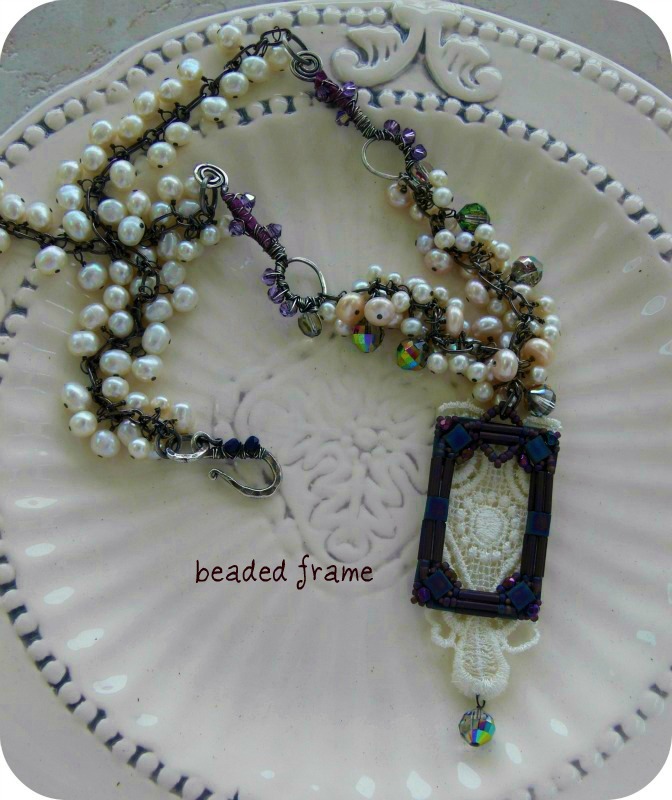 The requirements are to send a focal, a special clasp, and some coordinating beads. The purpose is to stretch imaginations, incorporate beads from your current stash, and, in getting someone else's beads, work with things you may never have thought to use before. I have two partners, Marcie Abney and Rebecca Anderson, because par for the course, I messed up and paired two people who had already been pairs in a previous Bead Soup Blog Party. And their soups couldn't be more different! Here is the first soup that Marcie sent me. 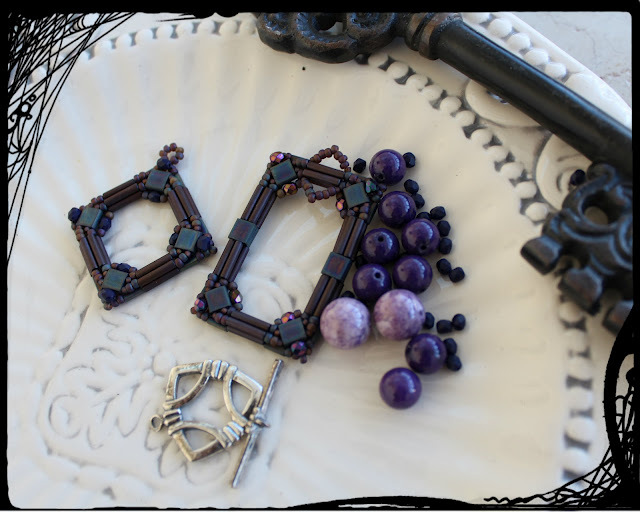 Two handmade-by-her seed-beaded frames, two shades of charoite, some Czech glass, and a cool triangular toggle. The frames stumped me for a while, but I finally decided to make some vintage-inspired pieces with the frames. First, I glued a piece of lace to the back of the rectangular frame. Then I coiled and hammered sterling silver wire, sandwiched it between two pieces of lilac suede, and with 26-gauge wire, wrapped all of this with crystal embellishments Then I wired lots of cultured pearls to chain. The larger Swarovski crystals are vintage, and I've been hoarding them! 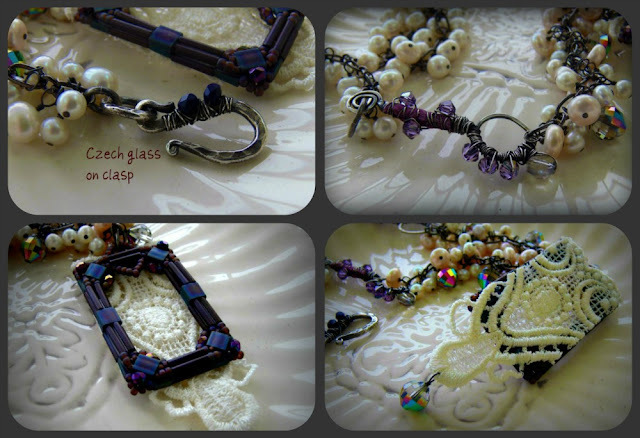 For the clasp, I used some of the tiny Czech glass beads and wrapped them to a hook clasp with thin-gauge wire. Next, I found two round earring findings in my stash and pulled out that hair-thin wire again. 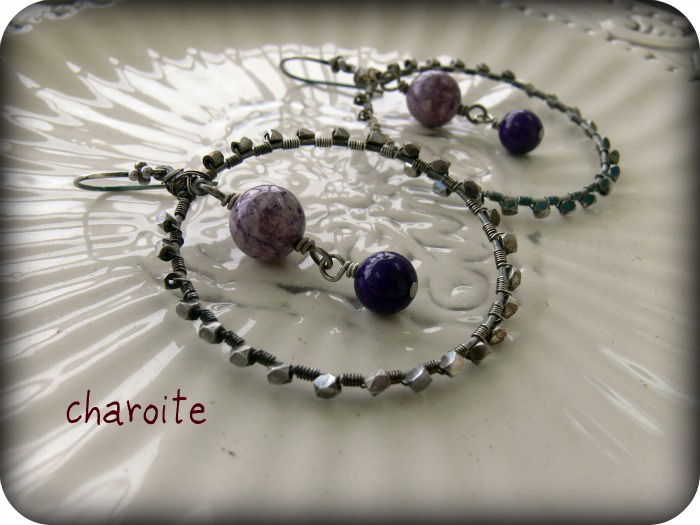 I wrapped the wire around the frames, adding little Thai silver beads as I went along, Then I added two of the charoite beads, one in each shade. For the next frame, I decided to once again dig into my vintage Swarovski crystal stash and found this amazing pendant. I like how it adds geometry to the square beaded frame. 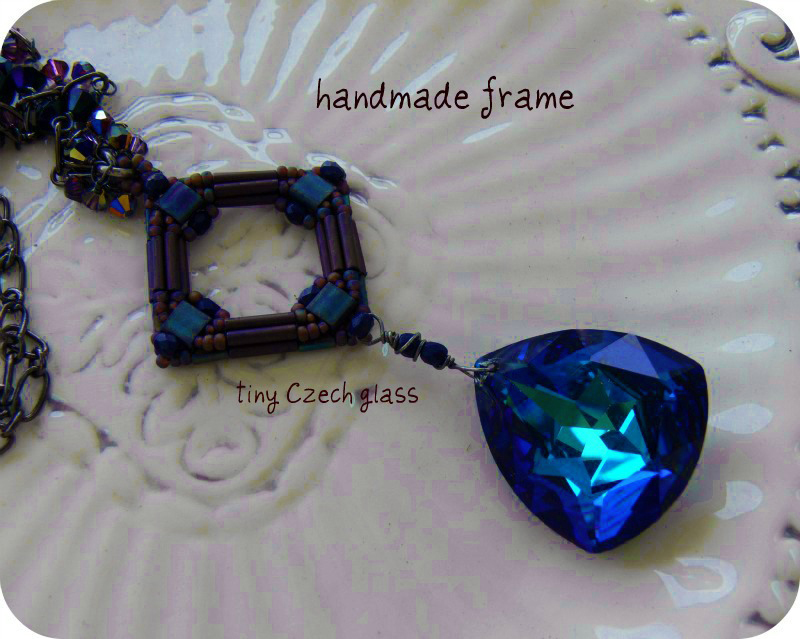 Between the frame and the crystal I wired two of the small Czech glass beads Marcie sent. 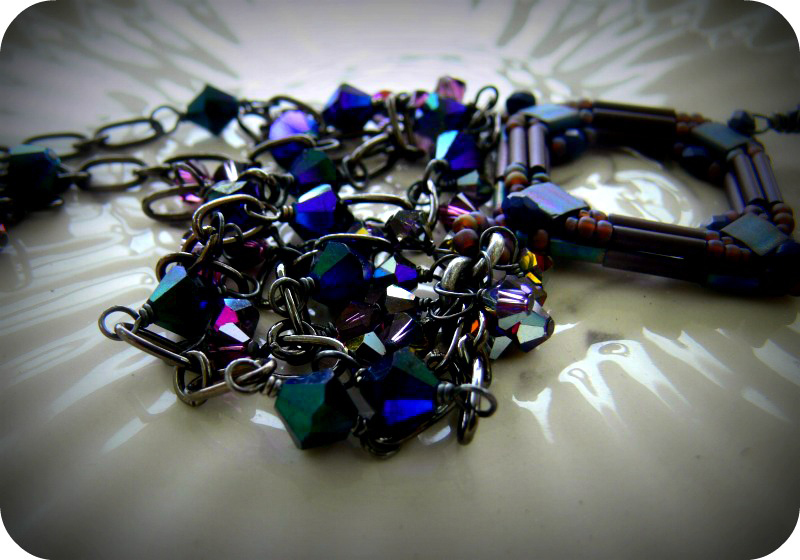 The rest of the necklace is made with 6mm Swarovski crystals between small sections of chain. But what about the toggle and the rest of the charoite? 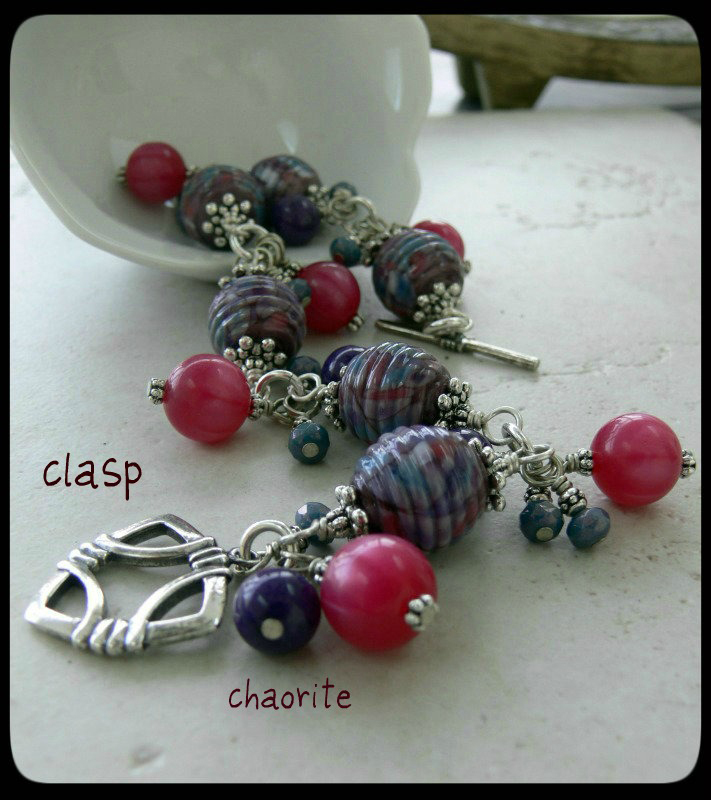 I took a left-turn at vintage and made a quick stop at "Lori's Usual Style" -- lampwork beads and vintage Lucite from my stash and the purple charoite and toggle sent to me. LOVE the colors! On to the second soup Marcie sent me! 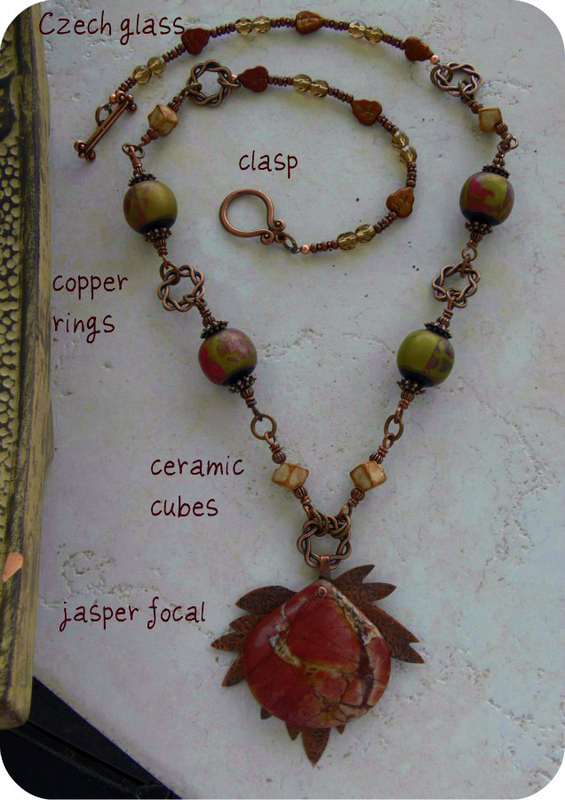 This one is a more earthy mix, and I have to admit -- I have a lot of trouble with brown, and I don't do a lot with copper. 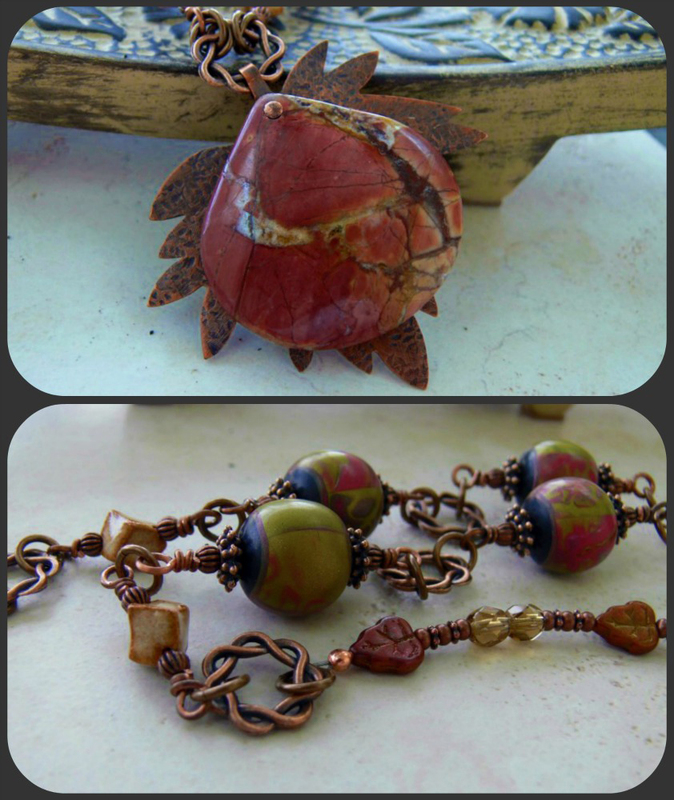 I decided to use all the soup in one piece, adding polymer clay beads to the necklace and experimenting with metal texturing and riveting for the focal. I had a copper leaf blank in my stash for a while. I've taken metal classes before, but as usual, once I got home, I never practiced that skill again! I used a texture plate from one of those metal classes to give the metal interest and bent the stem of the leaf to make a bail. I then did my first ever on-my-own wire rivet. I'm used to tube rivets but this kind -- not so much. I was so afraid I'd crack the stone as I worked it, but it all turned out! Now, on to Rebecca's soup! This is what she sent (along with a heaping handful of Czech glass). I was apprehensive at first because green is a color I don't work with all that much, but I dove right in. 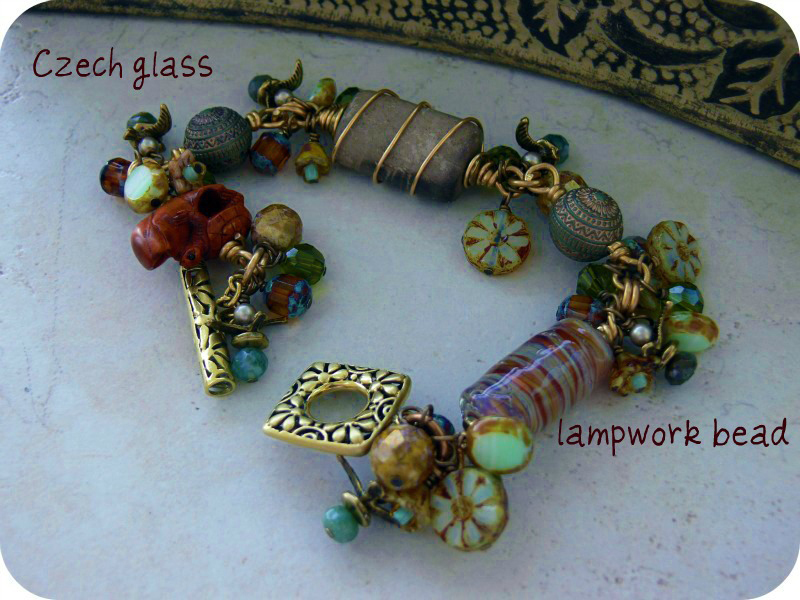 First, I made a bracelet using the brass birds, some of the Czech glass, tiny glass pearls, aventurine rondelles and one of the lampwork focal beads she sent. I made lots of dangles (oh how I love dangles) and wrapped a ceramic bead with bronze wire. I brushed the toggle down with steel wool so it wasn't as shiny and matched the wire. 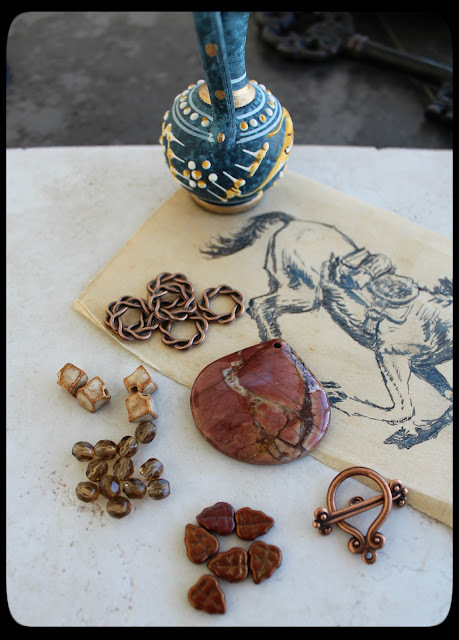 I dug into my stash and found an Ojime bead -- a boxwood bead carved as a turtle perched on a log. I had originally bought it for a necklace for Zack, but bought extras and for some reason never used them. This next piece is inspired by the classes I took with Stephanie Sersich. Rather than use the spiny knotting technique to cover the entire length of cord, I focused on making bead clusters, using some of the Czech glass Rebecca sent. In between the clusters, I worked the brass leaves into the macrame, and used the copper leaf clasp as the perfect finishing touch. 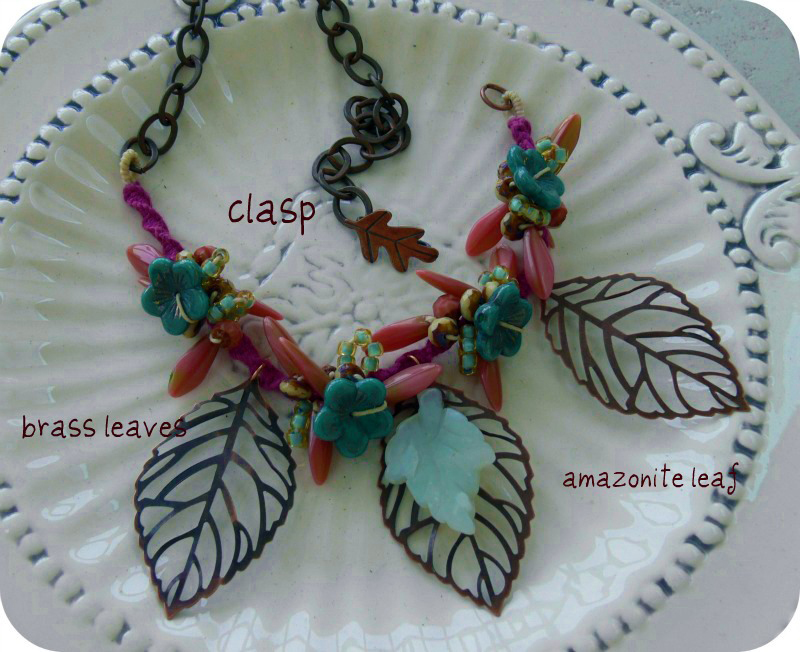 To accent the central leaf, I tied the amazonite focal leaf I was sent to the brass leaf with brown twine. I have to say this is so much prettier in person than in the photograph! I used up a lot of beads by making earrings. 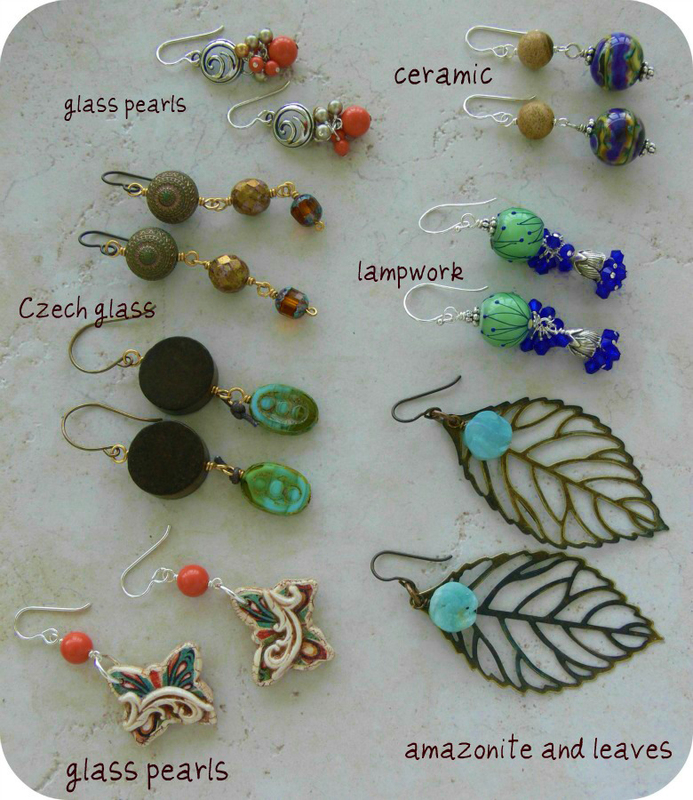 I LOVE earrings, wear them every day, and I went wild. My method was to carry a handful of the accent beads to my stash and start pulling things out randomly. I had the exact shade of blue crystal for the pale green lampwork, and the melon Swarovski pearls Rebecca sent matched PERFECTLY with the butterflies. The earthy ceramic rounds found a home with a pair of purple raku lampwork beads I forgot I had. Next, I decided to take the heart button, which could be used as a clasp, and make it part of the focal instead. I'm really quite proud of this piece because it's a complete 180 from what I originally planned. 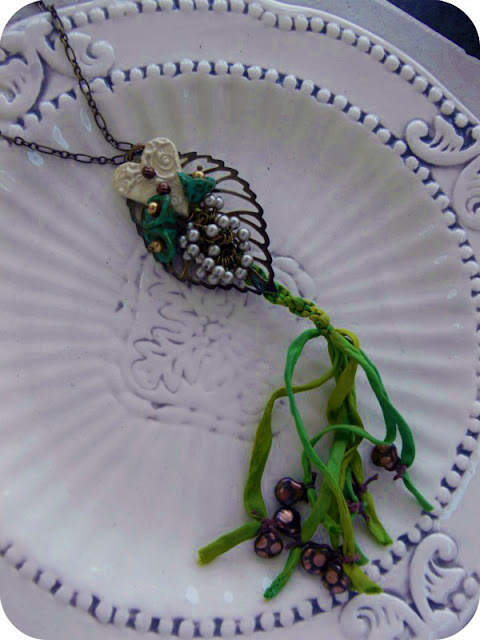 I intended to take the green silk and macrame a cord for a necklace like the three-leaf necklace above. However, as I braided and knotted, I quickly realized it wasn't going to be nearly long enough. 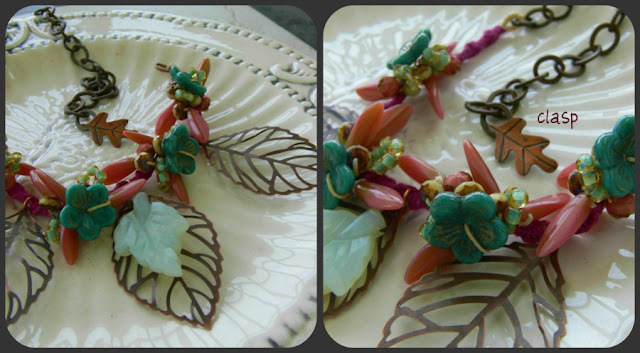 I tied the button to the leaf with the brown twine Rebecca sent, and tied on the Czech glass beads to the fringe. Then I used almost all the tiny glass pearls to create a cascade below the heart. On to tackle more of the soup! 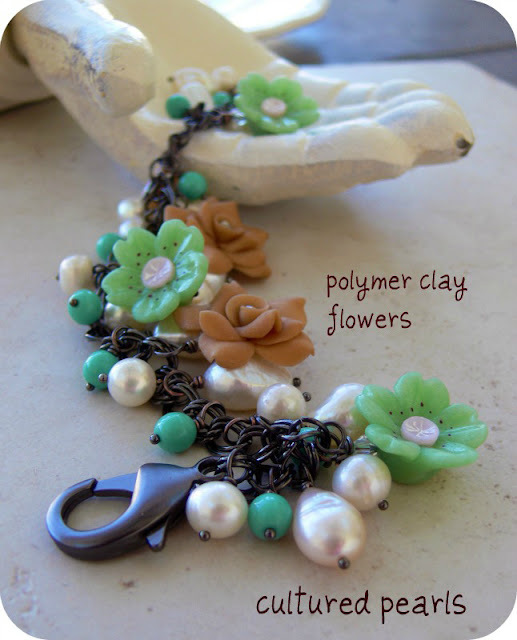 In the bracelet below, I used the cultured pearls and polymer clay flowers she sent to make a girly bracelet with a bit of a gothic edge from the gunmetal chain. I added large baroque pearls and green glass in between the roses and round pearls. 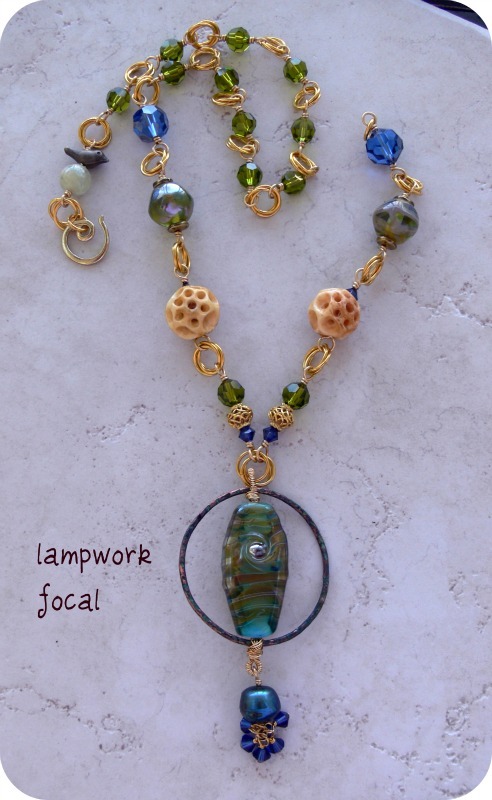 This next piece centers around just ONE bead in the soup -- the square lampwork bead in the pendant. 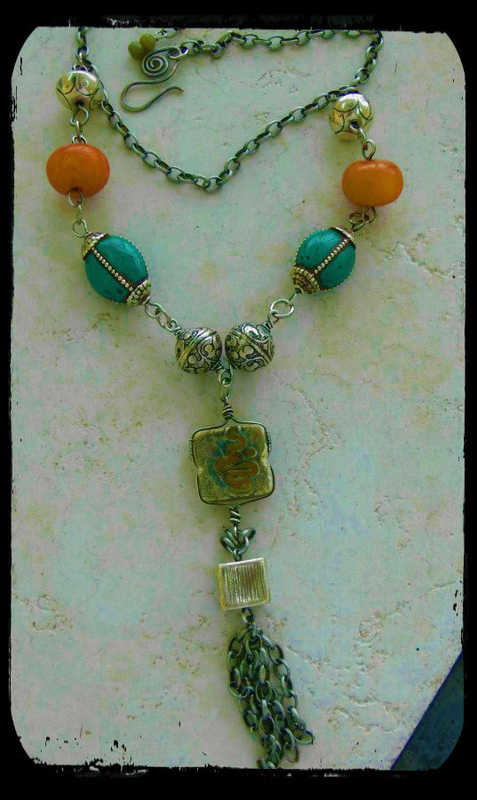 I dove into my stash to find Tibetan beads (something else I've hoarded) and made a simple clasp. My quandary was the orientation of the bead's hole. I wanted the squiggle design to point up and down, not side to side. 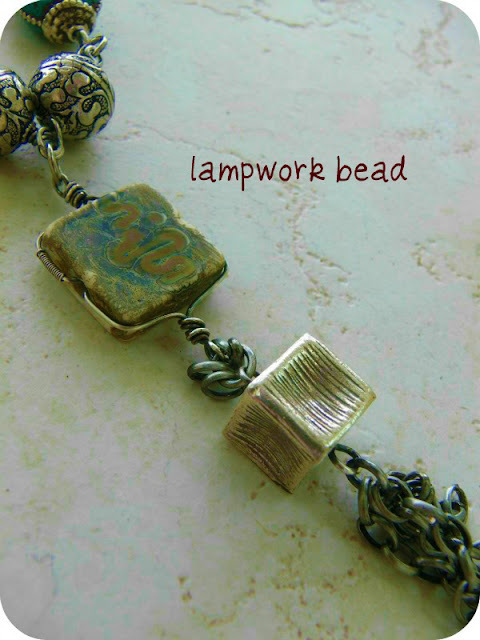 To fix this problem, I made two large briolette-style wraps, forming the wire around the lampwork bead. I added a little bit of 26-gauge wire, wrapping it around the silver frame. I also added a few links from the chain between the lampwork and the sterling cube, and added even more chain to make a tassel. I still had some aventurine rondelles left over. 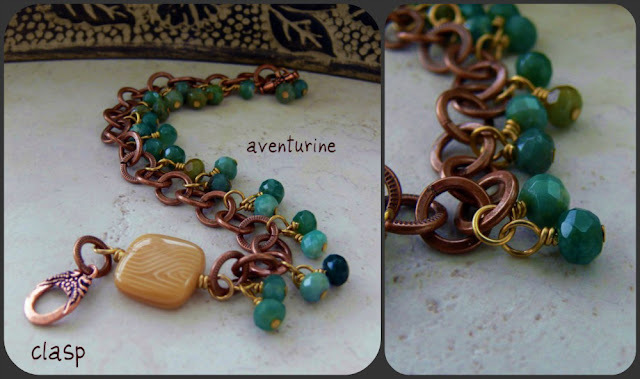 I made this delicate charm bracelet with the aventurine and a beige Czech glass square and finished it with the copper toggle Rebecca sent. To make the bracelet lush but not bulky, I wired one of the charms to the previous charm (you can see that in the right-side photo). I also chose to mix metals and used bronze-colored headpins. I thought this made a simple bracelet more interesting. On to the lampwork focal with the two matching accent beads. I was challenged because the bead has gold tones to it, and I don't have a lot of gold in my stash. I DID have a packet of large jump rings from somewhere-or-other, so I started making love knots as connectors and made links with olive green and deep blue Swarovski crystals. The focal is wired to a green patinated ring, and I wrapped the bail with thread-thin wire to give it a little more polish. I had two lonely vermeil beads in my stash, along with those funky bone beads and the pearl dangling beneath the focal. And check out the bird perched on the gemstone above the clasp (and the clasp attaches to the side, since it was too cool to hide behind the neck). I couldn't leave out these beads. I made zipper pulls with them! Now, everyone sends different amounts of beads for the party. The rules are you have to use the focal and the clasp, and can use any, all, or none of the accent beads, and to treat the package as if it were a gift to your best friend -- meaning choose things carefully and don't send what you were going to throw away. 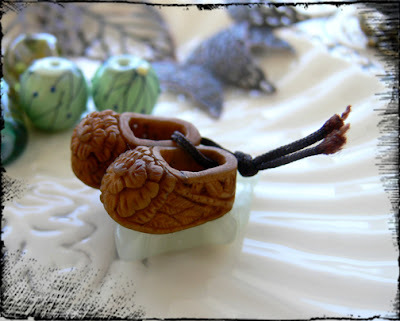 And what about those darling little wooden shoes? Well, Zack appropriated those for his treasure box, and I couldn't deny him. 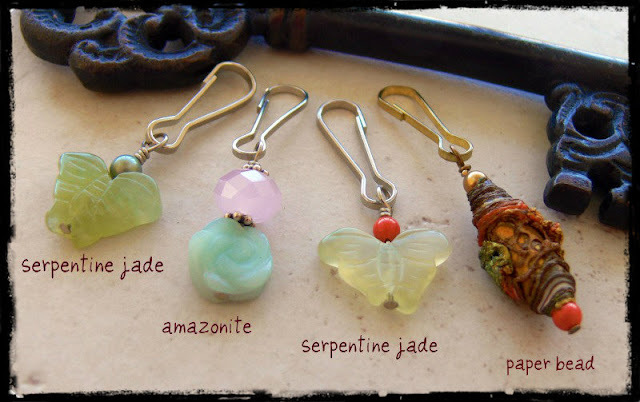 I hope you enjoyed taking a look, and please visit the other Bead Soup Partiers! This was a loooong post I made it to the bottom- Yay! !